Investigation of the enamel microstructure of 20 isolated rodent incisors from the ?Eocene Santa Rosa local fauna (Peru) yielded exclusively schmelzmuster with multiserial Hunter–Schreger bands (HSB). All three subtypes of multiserialHSB with parallel, acute angular, and rectangular interprismatic matrix (IPM) that were previously reported for caviomorph rodents are present. Two lower incisors with rectangular IPM can be attributed to the Octodontoidea, a caviomorph superfamily exhibiting this highly derived enamel type. 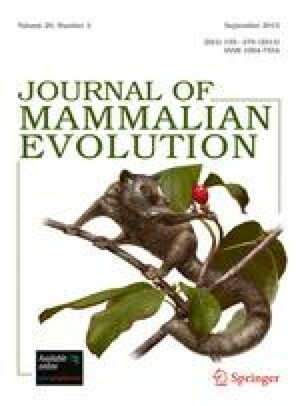 The plesiomorphic pauciserial condition that characterizes early Paleogene rodents such as North American Ischyromyoidea (including “Franimorpha”) has not been detected. It is therefore probable that the founder populations of South American Caviomorpha already possessed a derived incisor schmelzmuster with multiserial HSB that is shared with African Thryonomyoidea. Because on the North American continent a possible stem-lineage representative of Caviomorpha with multiserial HSB has never been detected, incisor enamel microstructure supports the hypothesis of an African origin of Caviomorpha from a common ancestor shared with Thryonomyoidea.